The Commissioners of Ridgely introduced Charter Amendment Resolution No. 2018-01 during their regular monthly meeting held on January 8, 2018. Charter Amendment Resolution No. 2018-01, if adopted, will amend the Charter of the Town of Ridgely to provide that: (1) a Commissioner shall hold office for a term of three years or until his/her successor takes office; (2) notice of the time and place of each annual election and the official ballot shall be published in at least one newspaper of general circulation in Caroline County and posted in two conspicuous places in the Town; (3) every person who is a citizen of the United States of America, is at least eighteen years of age, has resided within the corporate limits of the Town for at least six months prior to the next Town election, has resided within the State of Maryland for at least one year prior to the next Town election, and has registered to vote in accordance with the provisions of the Charter at least thirty days prior to the next Town election shall be entitled to vote at all town elections; (4) any person desiring to become a candidate for the office of Commissioner shall file a written certificate of candidacy with the Clerk-Treasurer no later than the close of business on the first Monday in April; and (5) write-in candidates shall not be considered in Town elections; to provide for absentee ballots and the cancellation of elections where there is one candidate or no candidates; and to clarify certain provisions regarding the appointment of the President of the Commissioners, the qualifications for Commissioner, voter registration, and Town elections. The foregoing constitutes a fair summary of Charter Amendment Resolution No. 2018-01 as introduced by the Commissioners on January 8, 2018. The Commissioners will hold a public hearing on February 5, 2018 during their regular monthly meeting commencing at 7:00 p.m. in the Town Office, 2 Central Avenue, Ridgely, Maryland, during which time interested citizens will be afforded an opportunity to provide comments and ask questions regarding Charter Amendment Resolution No. 2018-01. Written comments will be considered by the Commissioners provided that they are received by 12:00 p.m. on February 5, 2018 at the Town Office. The Commissioners intend to act upon Charter Amendment Resolution No. 2018-01 immediately following the public hearing. Copies of Charter Amendment Resolution No. 2018-01 are available in the Clerk-Treasurer’s office at the Town Office during normal business hours. This Saturday is National Drug Take Back Day! Every 10 minutes, a child is taken to the ER for accidental RX medicine poisoning. This is a chance to get expired and unneeded medicines out of your home. 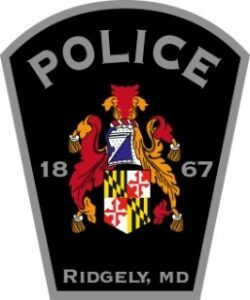 Click here to view the PDF with more information from the Ridgely Police Department. 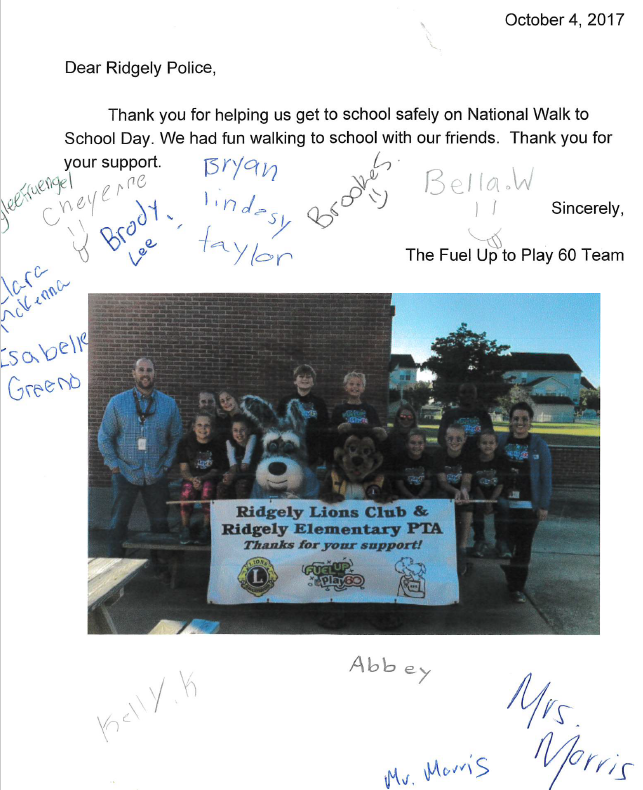 The Ridgely Police Department received this great note from the kids at the Fuel Up to Play 60 Team. Our police department is always happy to help our local students! The Town of Ridgely’s FY18 Budget was passed on June 5, 2017. Ridgely has adopted a balanced budget with total appropriations and revenues of $2,172,319. This budget is effective from July 1, 2017 through June 30, 2018. The Town Offices and Ridgely Police Department are under construction! Until further notice, the offices cannot be accessed through the front door. Please use the side entrance on E. Railroad Avenue to gain access to the building. Thank you for your patience during construction!